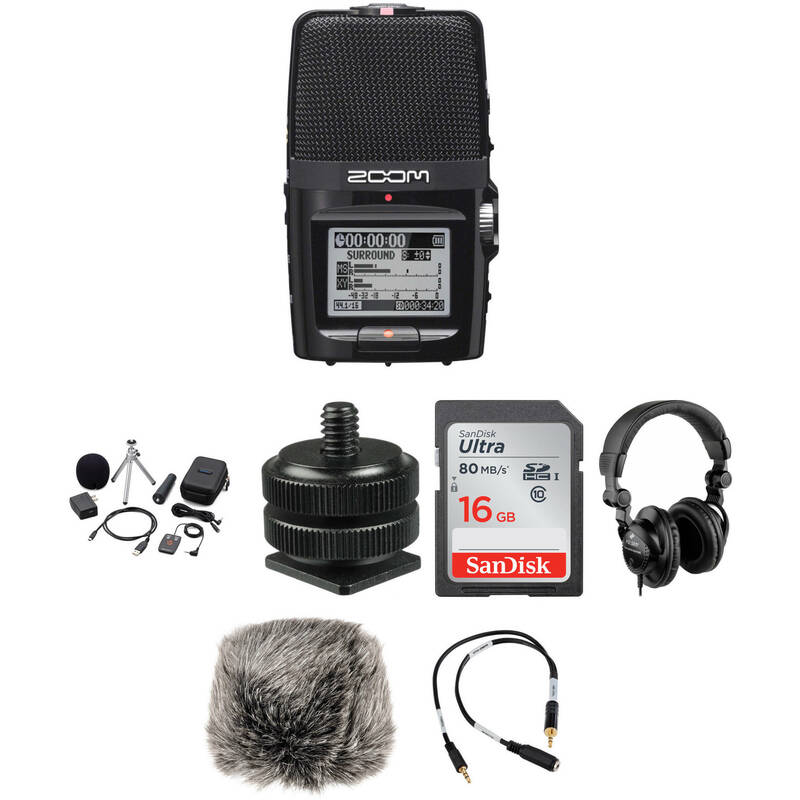 The Zoom H2n On-Camera DSLR Audio Kit is a B&H Kit that includes everything you need for convenient audio recording with an HDSLR camera. The heart of the kit is the H2n audio recorder, which offers pro-quality audio in a compact design. It can capture WAV or MP3 files to SD/SDHC flash memory cards, and a 16GB card is included so you can store hours of recordings. The recorder has 5 internal microphones that can record in 4 distinct patterns for exceptional versatility. A 3.5mm mic/line input allows the recorder to accept external sound sources. A USB 2.0 connector lets you transfer recordings to a computer. The kit also includes a shoe adapter with a 1/4-20 threading so you can attach the recorder to your camera's accessory shoe via the threaded tripod socket. And a provided cable connects to the recorder's output and attenuates the audio signal to the proper mic level for the camera's input. The cable is 1' long to eliminate excess slack and tangling. The cable also has a 3.5mm headphone jack for convenient monitoring with the included stereo headphones. The kit also includes the Zoom APH-2n accessory kit, which offers a wired remote and extension cable, a desktop tripod stand, a USB AC adapter and cable, a mic clip adapter, a padded storage case, and a foam windscreen.